I was the founding editor and managing editor of Animal Issues, a journal covering a wide range of topics related to human/animal interactions, now incorporated into Society & Animals published by Brill. 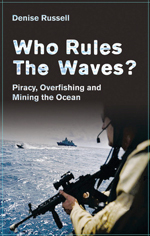 After the publication of my book, Who Rules the Waves: piracy, overfishing and mining the oceans in 2010, I have followed up further some of the topics related to marine creatures. I have presented conference papers and lectures on the demise of fish populations and the vocalizations of whales and dolphins. I wrote a long critique of the Japanese whaling program which will be published later this year. I intend to do more work on whale and dolphin vocalizations/communications including field research. I also plan at least two more papers on the ethics of killing of whales for research. I have written lengthy responses to the Federal Government’s plans for marine parks in the north and north west of Australia. These marine parks (or lack of them) have important implications for marine creatures. I will shortly be completing responses on the plans for the coral sea and the east. I have given 3 conference presentations on the problems of animal experimentation and the proposal for changes to the regulations in that area in Australia. With Melissa Boyde I have maintained and up-dated the web-site: Replace Animals:http://www.uow.edu.au/arts/research/raat/index.html which serves as an information base for alternatives to the use of animals in research. I was interviewed by the BBC on problems in crashing fish populations in 2011. Outputs: Recent Publications Related to Animals: ‘Ethical obligations to cetaceans: a case study for Singer’s animal ethics’ in R. Younis (ed.) On the Ethical Life, Cambridge, Cambridge Scholarly Press, 2009. with M. Boyde, ‘The RAAT Project: Alternatives to using animals in research’ in A. Yeatman (ed.) The SInet 2010 ebook, SInet, University of Wollongong, 2010, http://ro.uow.edu.au/sinet/1 ‘The Bengal tiger, the Irrawaddy dolphin, a humble fisherman and lone researcher: a tale of compassion, connection and foreboding’ in M. Vyas (ed.) Being for the Other: Issues in Ethics and Animal Rights, New Delhi, Daya Pub. House, 2011. Who Rules the Waves: Piracy, Overfishing and Mining the Oceans, Pluto, London, 2010. Animal Studies Teaching: I set up the course ‘Humanity and Animality’ in the Department of General Philosophy, University of Sydney in 1980 and ran it in various forms until 1999. In 2010 I gave a guest lecture in the Law School course, ‘Animals and Ethics’ at the University of Wollongong.